In Luke’s gospel there are two basic ideas that are a key to helping us interpret this beginning of the preaching mission of Jesus: Luke always tries to read the history of Salvation using these basic ideas of “time and space “to help his readers concentrate on this message which is actual, real and present in their own lives. Let us see how this is so. This Sunday’s reading takes us into the second part of the synagogue ritual – the biblical commentary which usually takes place after the reading of the Scriptures. His commentary is not very long – it has one phrase only! “The promises we have just heard have been fulfilled here today.” These words caused different reactions among those listening. Some commentators say the people were surprised, joyful, others that they were annoyed and angry and wanted to throw Jesus over the cliff. Difficulties increased when the message and action plan had to be understood taking into consideration the two ideas mentioned previously “time and space”. He who was speaking to them was just the son of Joseph from down the road, so well known to them all. Maria’s son, whom they crossed every day with his water jar walking through the dirt streets. How could a prophet come from a lower class family of the town? He was just a carpenter, who had once fixed the kitchen table or straightened the door of someone’s house. And to make matters worse they had also heard what this same son of Joseph had done in neighbouring cities but were aware he had done nothing of this among his own? 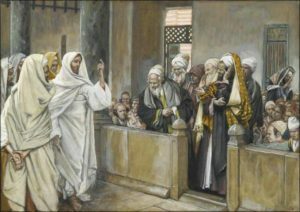 Jesus in the synagogue continued to explain to them the Word of God proposing salvation for all people, besides the Jews, something totally unacceptable to them. He returns to take hold of the Scriptures to demonstrate that the prophets had already manifested that attitude of God in favor of strangers in distress. Elijah and Elisha, Jewish prophets, were instruments of salvation in a time and place where pain and need were extreme, in the widow of Sarepta and Naaman, the Syrian. It means that Jesus’s message is not at all contrary or alien to Scripture and that the pretensions of some people now are a misinterpretation of it. He announces a salvation from all oppressions. His salvation is not against anyone, but on behalf of all. God acts in our own history and his plan is to bring us salvation. This salvation acts and manifests itself wherever concrete history in its “time and space “ needs it…there where the poor person is poor, where the blind don’t see, where the oppressed are not free, where we with our blinded vision limit Christ’s presence and the scope of His salvation. This complete reading from verse 14-30 has always been a very significant text for my own personal discernment down through the years—-giving me light, direction and new life. I even remember doing a retreat on this text, outside Lisbon, Portugal many moons ago. It lives with me since then. Let us give ourselves time to recognize where and when the Lord is present in our lives and outside our daily routine. Stretch and strengthen our heart and vision, Lord, so that we may be worthy instruments for a wider mission entrusted to us. Through you Lord Jesus, Amen. Sister Joan O´Shanahan OP, Victoria, Argentina.